On organizing the Volkswagen plant in Chattanooga: "I'm confident once we agree on process that the workers will choose to have UAW representation." DETROIT -- UAW President Bob King today said he believes workers will "overwhelmingly" support increasing dues for the first time since 1967 to shore up the union's strike fund and help it win better contracts. 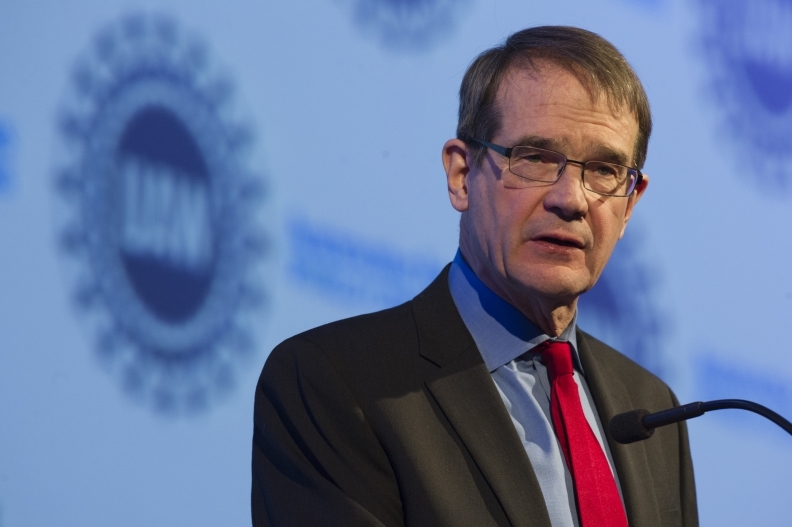 King confirmed after speaking at the Automotive News World Congress that the union's leadership is proposing a 25 percent increase in the dues deducted from workers' paychecks. Workers would be asked to approve the increase at the UAW's Constitutional Convention in June, when they also will elect King's successor as president. UAW members currently give the union two hours' pay per month. The proposed increase would contribute another half hour's wages directly into the strike fund, which King said has about $600 million, down from around $1 billion at its peak. Declines in UAW membership, as well as ongoing organizing efforts at foreign-owned auto plants in the southern United States are among the reasons that the strike-fund balance has declined. "Those campaigns take a lot of money," King said. "I think our workers will overwhelmingly support this." The UAW is still waiting for Volkswagen Group of America to decide how to respond to the union's request that it be allowed to represent workers at the VW plant in Chattanooga, Tenn. King said he believes a decision will be reached "soon." The union has submitted signed cards of support from what it says is a clear majority of plant workers. But anti-union activists dispute that most workers support the UAW, and labor experts say it appears unlikely that the union would be recognized in Chattanooga without an election. "We've got a very strong majority there," King said in an interview with Automotive News. "I'm confident once we agree on process that the workers will choose to have UAW representation." Volkswagen executives have said they will respect the wishes of the workers in Chattanooga but have given little indication of how they plan to respond to the UAW. "My view is that democracy is a very important part of the American culture, and people have to be able to choose which way they go," Volkswagen Group of America CEO Michael Horn told reporters at the Detroit auto show Monday. "I will accept -- support or accept -- what the workers in Chattanooga eventually, at one point of time, will decide to do. There's a big back and forth."